This section configures the mail server and users for sending the email notifications. The options to configure this mail service are the following. Mail Server. SMTP Server which sends the email. Mail User. Email account allowed to send emails, this account is needed if the mail server requires SMTP authentication. Password. Password of the configured account, this password is needed if the SMTP server requires SMTP authentication. From. Email account that sends the email, this account will appear in the SMTP header From and it will be used if the receiver replies the email. To. Email account that will receive the emails of notifications. Enable TLS. 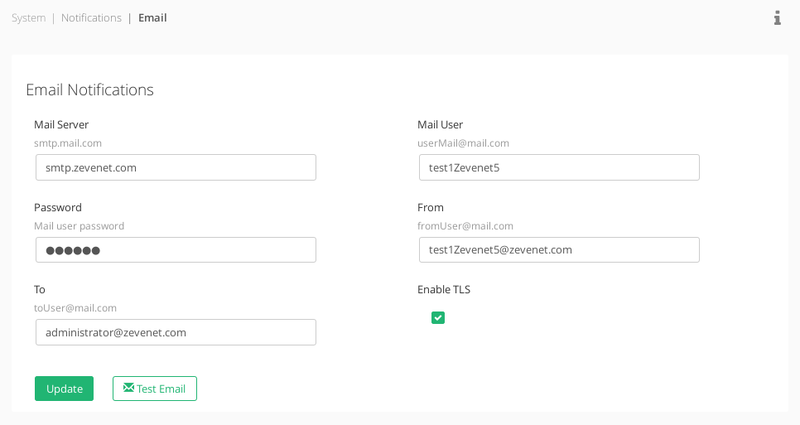 Enable Secure TLS authentication for sending emails, this property uses STARTTLS and this feature has to be supported in the SMTP server. Click on the Update button to apply the new changes and then press on Test Email in order to test the mailing service.